"It's been over 58 years since my first attempt to get fellow Gators fans to "stand up and holler.” Even today, my enthusiasm for the Gators has not changed!" says tournament namesake George "Mr. 2-Bits" Edmondson. Mr. 2-Bits Scholarship, Inc. a non-profit organization governed by a volunteer Board of Directors was started with the help of several passionate Gators and the assistance of Gator Boosters and UAA. The proceeds from the weekend of events will fund scholarships for the UF Spirit Teams (cheerleaders, Dazzlers, and Mascots). Over twenty-five years ago George Edmondson funded a scholarship endowment for the University of Florida Spirit Teams as a way to financially assist dedicated Gator Cheerleaders. These funds are all but gone. To carry on this incredible Gator Spirit and the tireless efforts of all three Spirit Teams at UF, your help is needed. This years scholarship invitational, which is proudly presented FOR THE 4TH YEAR by AT&T - The Real Yellow Pages, kicks off the Florida/Citadel Football Weekend. This prestigious weekend of events will begin with a Friday VIP sponsor-player continental breakfast at the UF Golf Course. The Golf Invitational immediately follows at the University of Florida Golf Course with a 11:00am shotgun start. Immediately following the tournament all players and guests are invited to stay at the golf course for a unique, fun, and casual Friday evening dinner and silent/live auction party with complimentary beer & wine provided by St. John Beverage. Following dinner, we will all gather at the 2-Bits Lounge at the Hilton UF from 8-10pm for more food, fun, billiards, and more. The presentation of the scholarship check to the Cheerleaders, Mascots and Dazzlers will take place the following day during the UF-Citadel game. There are limited player and sponsor spots available in the event and local business leaders and Gators fans are urged to help kick off the 5th Annual Mr. 2-Bits Scholarship to grow for generations to come. 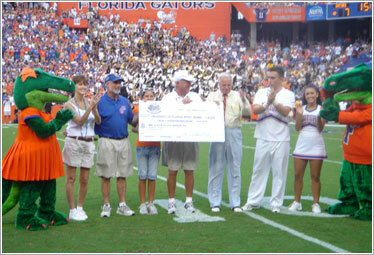 3rd Annual Golf Invitational check presentation of $20,000 at the UF-UCF football game. Pictured above (left to right): Alberta, Suzanne Clark, Karl Kaufmann (Kcom Media), Dennis Mathews (Bellsouth) and grandaughter, George "Mr. 2-Bits" Edmindson and members of the UF Spirit teams with Albert.